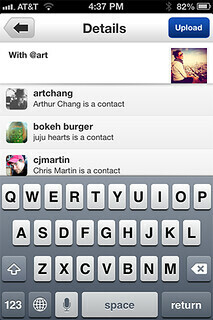 New with Flickr for iPhone: Mention your friends, download your photos, faster uploads and more! Our latest update to the new iPhone app is here! It brings quite a few features that many of you have asked for. Take the conversations to another level! 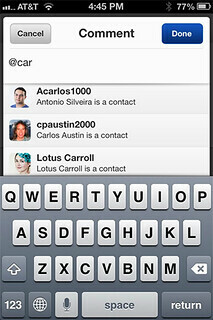 You can now mention your friends right from the app. Start by typing in the @ sign, and then simply select one of your Flickr contacts to mention them in a title, description or comment. We will notify your friends that you mentioned them. You can now download your own photos from Flickr to your camera roll. Just tap the share icon on any of your photos and tap “Save Photo”. A few seconds later the photo will be in your iPhone’s camera roll in the largest available resolution. Uploads from the Flickr app are much faster. We did some magic to optimize uploads, but also start uploading in the background while you think about the photo’s title or where you want to share it to. You basically get the best of both worlds: High resolution uploads that will make sure that you can enjoy your photos in great quality in the future, plus fast uploads in the background, so that you don’t have to wait. And there is more: Photos that you take with the Flickr camera are now immediately saved to your camera roll. We also now display an even higher resolution image in the lightbox view, so you can zoom in further and see all of the details. Lastly you can now take photos in a snap by using your iPhone’s volume up button. 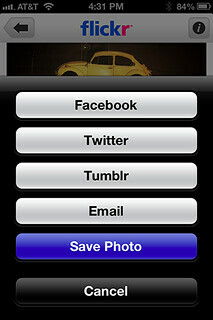 Head over to our iPhone App page and grab the latest version of Flickr for iPhone. If you have any questions or want to give us feedback, join us in the Flickr for iPhone group. Still hot: The Top 10 Flickr for iPhone Tips we published recently.